A fantastic line of certified organic skincare products that are packed with nourishing oils and are great for the skin! 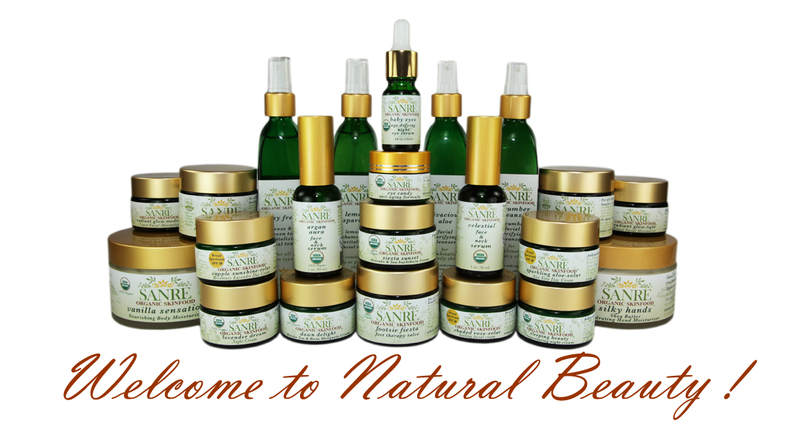 certified organic products from SanRe Organic. I simply love Rosehip seed oil. SanRes Rosehip Revival is a 100% pure, high quality certified organic oil. Their oil comes from the lush mountain valleys of the Andes Mountains. It's rich and soothing and does a fantastic job of moisturizing and reducing redness. Fantastic product in a convenient little glass dropper. This lovely lip moisturizer comes in a glass rollerball applicator. With 100% certified organic oils of almond, avocado, apricot kernel, peppermint & sweet orange, it leaves the lips silky smooth with a tad of tingle. It seems to have a slight plumping effect and definitely adds moisture to dry lips. Everything is organic in this chocolate balm. While not my favorite of the organic lip balms I've tried, it's definitely moisturizing and soothing and does not have an overpowering "chocolately" scent or flavor like some other chocolate balms. I'm very excited about this organic eye serum. It contains only pure organic oils of almond, jojoba, rose, rosehip seed and fennel along with GMO-free CoQ 10. Soothing, softening and deep penetrating, this oil leaves the areas around the eyes so soft and smooth. Most products irritate my eyes so I have to be extra cautious. This oil did not irritate in any way and also helped restore the dry skin I have at my lash line. I highly recomend this product and just 1 drop is all you need each night. All their products have been developed with care and they do not test on animals. And most importantly, they are certified organic!